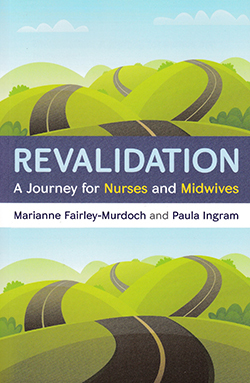 This publication informs individual registrants of the Nursing and Midwifery Council’s revalidation requirements. While I would recommend it to registrants wanting a comprehensive understanding of revalidation and underpinning in-depth theory, there are a few annoying aspects that can cause confusion. Continuity in wording is lacking: ‘fitness for practice’ and ‘fitness to practise’ are both used. The revised code is outlined but delegation is omitted. The introductory chapter lacks focus, but those on continuing professional development (CPD), feedback, reflection, reflective discussion and confirmation are informative. Excellent examples of CPD and feedback are provided, although the section on the latter lacks clear guidance in linking to the code. Reflection is demystified and key components highlighted. Models of reflection are explored, but detail of the NMC reflective form as a simple model/framework is scanty. All sections are clearly underpinned by theory. Reflective discussion and confirmation chapters outline registrant and employer responsibilities, signpost to supporting material, and provide useful appraisal links. The level of underpinning theory, although useful to some, may be too detailed for registrants looking for revalidation guidance only. Conversely the practice hours section could be expanded.